Suit Filed to Protect Polar Bear from Pesticide Contamination. Crag Law Center files suit for the Center for Biological Diversity to force EPA to curtail contamination of the Artic. On behalf of its client, the Center for Biological Diversity, Crag Law Center has filed suit against the Environmental Protection Agency (EPA) for failing to consider impacts to the polar bear and the bear’s Arctic habitat from toxic contamination resulting from pesticide use in the United States. The EPA approves pesticides for use in the United States that are known to be transported long-distance through various pathways, such as through atmospheric, oceanic and biotic paths, to the Arctic. 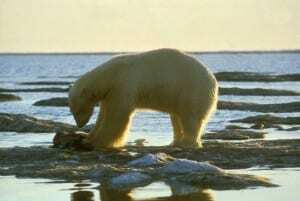 These pesticides then become part of the food chain in the Arctic and reach some of their greatest concentrations in polar bears, which are top-level predators. Human subsistence hunters in the Arctic, who share the top spot on the food web with the polar bear, also face increased risks from exposure to these contaminants. Among the problems for polar bears with pesticides and related contaminants are the links between these toxins and suppressed immune function, endocrine disruption, shrinkage of reproductive organs, hermaphroditism, and increased cub mortality in bears. EPA is the agency responsible for registering all pesticides before they can be lawfully used in the U.S. The lawsuit is designed to ensure that EPA analyzes the impacts of the pesticides it is registering on polar bears and their habitat, and only allows uses of pesticides that will not impact the polar bear’s survival and recovery. I can’t believe that pesticides that are harmful to polar bears were legal in the first place! I’m so glad that problems like this, that can easily get overlooked, are being addressed!